Climate change related challenges & concerns have united the chasm across socio-political, geographical, cultural & professional spectra. Persuasion, coercion & offering incentives like carbon credits & personal carbon trading are all being implemented to reduce the global carbon footprint. No civilisation sustaining activity including surgery is carbon neutral. Till the emergence of carbon neutral ‘chlorophyll technologies’ reducing & limiting the carbon footprint is the only option. 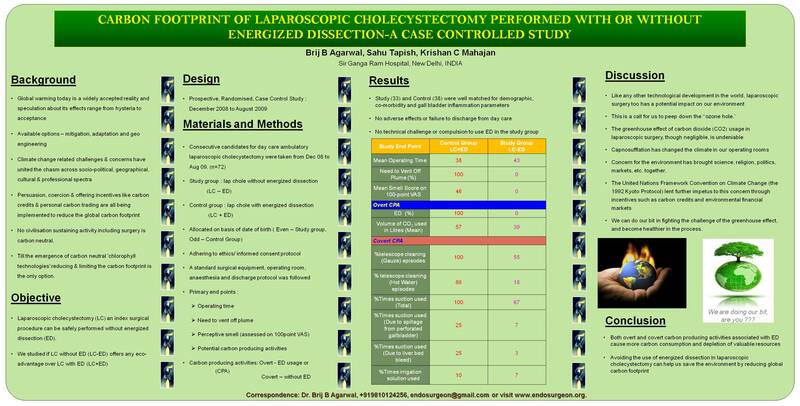 Laparoscopic cholecystectomy (LC) an index surgical procedure can be safely performed without energized dissection (ED). We studied if LC without ED (LC-ED) offers any eco-advantage over LC with ED (LC+ED). From December 2008 to August 2009, consecutive candidates for day care ambulatory LC were allocated to either Study group i.e. LC-ED (Even date of birth) or Control group i.e. LC+ED (Odd date of birth) adhering to ethics/ informed consent protocol. A standard surgical equipment, operating room, anesthesia & discharge protocol was uniformly followed. Operating time, need to vent off plume, perceptive smell assessed (100 point visual analog scale-VAS) environmental pollution & potentially carbon producing activities were the study end points. Carbon producing activities (CPA) could be overt i.e. ED usage or covert@. The Study (33) & Control (38) groups were well matched for demographic, co-morbidity and gallbladder inflammation parameters. There were no adverse events or failure to discharge from day care. There was no technical challenge / compulsion to use ED in the study group. Operating room smelled of plume in all LC+ED surgeries. Avoiding the use of energized dissection in laparoscopic cholecystectomy can help us save the environment by reducing the global carbon footprint.